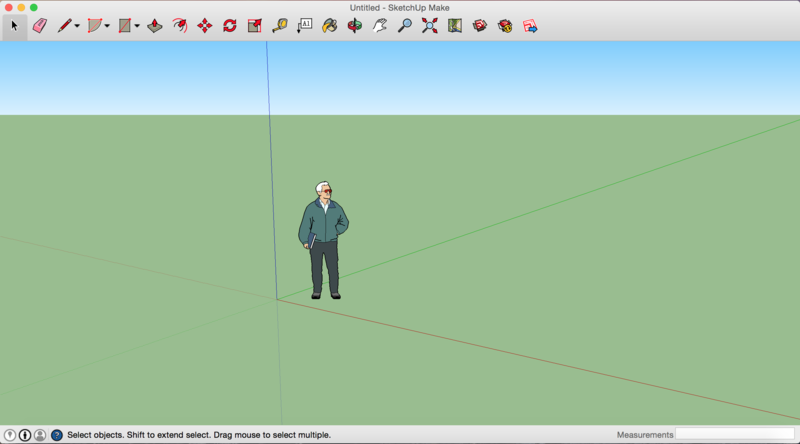 SketchUp is a free cross-platform application that lets its user build, measure, and design three-dimensional projects. 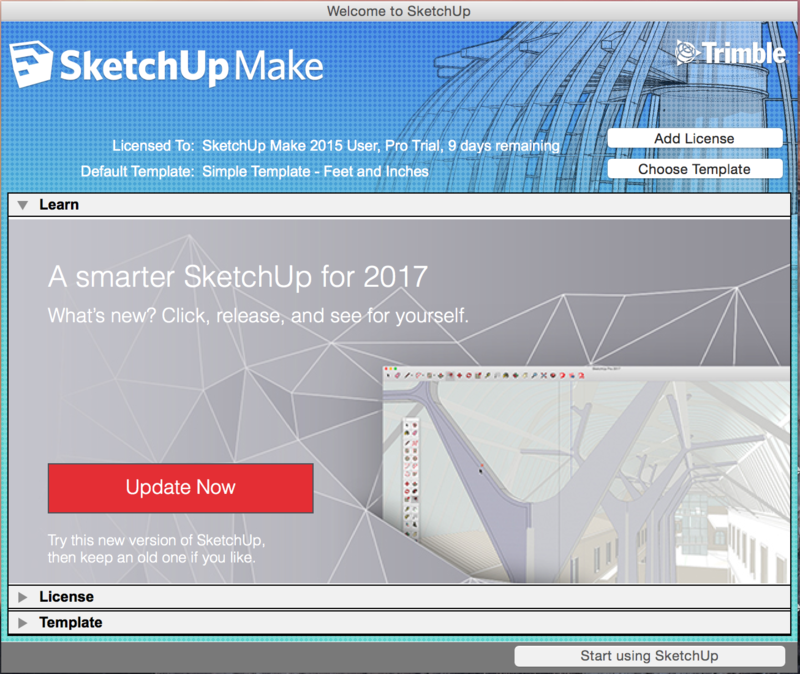 It comes in two versions, SketchUp Make, the free version used for personal projects, and SketchUp Pro, which is licensed for commercial work. In this tutorial, we will be focusing on SketchUp Make, which is the version most readily available to students. Download SketchUp Make, and we’ll get started. SketchUp is available for free through the website SketchUp.com/download. Simply follow the download instructions, and when you’re finished, click the “Download SketchUp Make” button. Follow the installer’s instructions. Once the download is completed, open SketchUp Make, and let’s get started. After you open SketchUp for the first time, you will be greeted with this window. Click the “Start using SketchUp” button in the lower right-hand corner to get started. After clicking this button, a new window will pop up. This will be the space in which you design your projects. If you can see the little man on the green field, you know you are in the right place! And from here, what you do is up to your imagination! A big part of designing your project will be understanding and utilizing the tools and display of the creation window. For the purposes of our tutorial, let’s go over the basics, and then give you time to explore the tools yourself. Firstly, if you look at your creation space, you will see 3 colored lines intersecting across your screen. These are the main guidelines for the space, and they correspond to the x (green), y (red), and z (blue) axes respectively. While SketchUp allows the user to place shapes and objects at any angle or orientation, you will often use these guidelines to move a face or object across straighter lines. As we can see from the video above, you can move objects that you create in any direction. However, if you want to move them in a straight line, you can simply maneuver the object until it “snaps” to a guideline (indicated by an actual change in the movement line’s color and the words “On ______ Axis”). From there, moving the object in the axis’s direction will move it across a straight line. At the very top of your window, you’ll find the Tool Bar. Here is located the myriad of tools available to help you in your construction. Each tool has its own unique properties and effects, so mastering knowledge of each is crucial to getting the most out of this application. Briefly, let’s go over each tool in the Main Tool Bar, and find out how you can utilize it. Alternatively, if you prefer learning by demonstration, you skip the explanations and watch the tools demonstration in the video below! Select Tool – Allows you to select specific lines, shapes, and surfaces to edit and morph. Eraser Tool – Erases specific lines, shapes, and surfaces after they are first selected. User can also click and drag with the Eraser Tool to make a wide selection of bodies erase. Another method of erasing is simply to right-click on a body with the Select Tool, and then select the “Erase” option. Line Tool – The line tool lets the user draw on surfaces and make free-form shapes. To make draw shapes, choose either the “Line” or the “Free-form” drawing tool, and create a closed polygon. Arc Tool – The Arc Tool allows the users to create arc shapes with precise angles. There are four different methods to choose from. The standard “Arc Tool” first sets a center point, then sets the start and end points of your arc using a protractor. The “2-point Arc Tool” sets two points, creating an arc by dragging out the shape. The “3-point Arc Tool” draws an open arc that is based upon one pivot point. Finally, the “Pie Tool” works just like the regular Arc Tool, except the end result is not an open arc, but rather a closed shape. Shape Tool – The Shape Tool lets the user create polygons with which he or she will build the world. Like the Arc Tool, the Shape Tool also comes in four different variants. The Rectangle Tool creates a quadrilateral by clicking and dragging. The Rotated Rectangle adds a third dimension to the quadrilateral by allowing rotation at an angle. The Circle Tool creates a circle based upon a radius selected through clicking and dragging. Finally, the Polygon Tool allows the user to create custom polygons. To set the number of sides on your shape using the Polygon Tool, while the shape is clicked and dragged, type “Xs” (X and then s), where “X” stands for the number of sides you want on your polygon, and then press “Enter/Return”. Push/Pull Tool – The Push/Pull Tool brings shapes into the third dimension. To create a three-dimensional object, first create a shape using the instructions above, and then use the “Push/Pull” tool to “drag” that shape up or down. The result will be a three dimensional body with a face that is your shape. Offset Tool – The Offset Tool allows you to offset a line or shape quickly by clicking and dragging; useful if you want to quickly create an outline or border. Simply click on the line or shape you which to offset, and drag until the desired result is achieved. Move Tool – The Move Tool lets the user move objects or surfaces across the x, y, and z axes. To move an object or surface, simply click on it with the Move Tool, and drag your mouse to its new destination. Rotate Tool – With the Rotate Tool, you can rotate an object to view it at any angle. First use the Select Tool to select the body you want to rotate, and then use the Rotate Tool to rotate it. Depending on the plane around which you want to rotate you object, the protractor will turn red, blue, or green respectively. 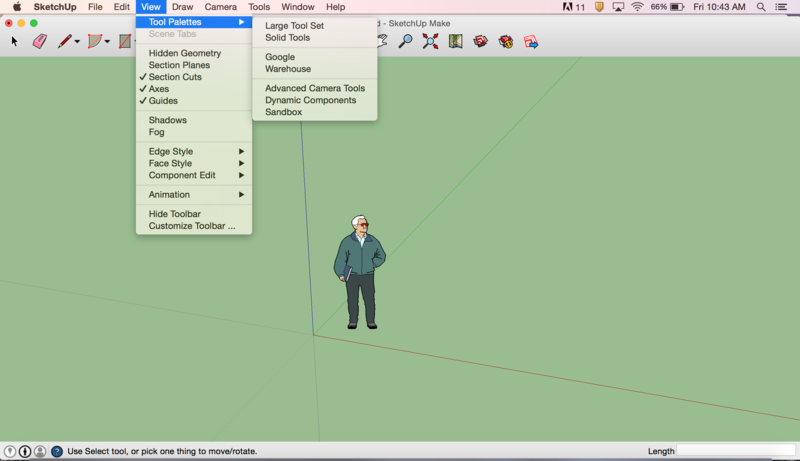 Scale Tool – Lets you resize bodies while maintaining their proportions. Simply click and drag on one of the green boxes to resize an object along the x, y, or z axes. Tape Measure Tool – Like a real life tape measure, the Tape Measure Tool lets the user measure the length or width of an object’s face. Click and drag across a surface to measure it. The Tape Measure Tool can also be used to create precise guidelines; press Ctrl or Option and drag once the plus sign appears next to your cursor. Text Tool – This tool lets you create screen text that can be used as floating or leader text. To make a floating label, simply click a blank area where you would like the screen text to appear. Type and press enter. To make text which has a leader pointing to an entity, click the entity, move the cursor to position the text, and then click again. Paint Bucket Tool – The Paint Bucket Tool lets you add color and effects to an entity you create. Select from a myriad of options on how to customize your object, and click on the face you wish to apply the changes to. Orbit Tool – The Orbit Tool revolves the camera to move around the object. Clicking and dragging in a direction will rotate the camera clockwise or counterclockwise. Pan Tool – The Pan Tool also moves the camera, but unlike the Orbit Tool, the Pan Tool only moves across one plane. Click and drag to reorient the camera. Zoom Tool – The Zoom Tool zooms into an object; click and drag up or down to zoom in or out. If you ever want to reorient your object to its original zoom, you can use the Zoom Extents Tool, which is just to the right of the Zoom Tool. This will bring you back to normal view with just a click. Now you have a good grasp of the basic tools that we use in SketchUp! However, these are not the only tools which are available for you to use! If you go to View, then Tool Palettes, you’ll see several different options for alternative tool sets, including tools that you can download! Click on the Large Toolset to add an additional fifteen tools to your Tool Bar! Master your new selection and go from beginner SketchUp artist to expert!